Day of rest. Went to church. We had a fast and testimony meeting, then a lesson on the gift of the Holy Ghost in Sunday School, followed by a lesson from an Ensign article on not being in a hurry. Ironically the teacher went into overtime and was just about to start discussing the point "Do not be in a hurry to be done" when he was reminded that the meeting should have ended 10 minutes ago. In spite of the irony the lesson was good, though. There is a difference between being urgent and being in a hurry. When you are in a hurry you move faster than you should. It takes humility to accept the correct pace. At dinner time I overestimated the recovery of my stomach and ate more than I should have. This resulted in throwing up later. But I started feeling better towards late evening and was hungry again. We also went on an evening walk on the Provo River Trail and I brought along my new toy - a digital level that we bought at Home Depot for $40 on Saturday. We measured a whole bunch of grades. I began to understand why the trail is so slow in spite of not having any notable hills. On parts that you would think are flat the grade keeps fairly uniformly fluctuating from -2.0% to +2.0%. A good rule of thumb is to compensate for a given distance at a given grade uphill you need to run the same distance at double the grade downhill. This works quite well for grades up to 5%. So if we integrate, running on the trail with no elevation gain is like running up a 0.5% steady grade. A.M. 10.18 with Jeff in 1:17:06. Did a couple of pickups. First 0.75 in 3:56.7 with the splits of 80, 78, 78. Then 1.5 in 7:48.0 with the splits of 79, 79, 80, 76, 78, 76. I felt very relaxed at 80, at least for the moment I felt like I could run that forever in a pack. 78s felt sustainable, but not pleasant. 76s felt more unpleasant but I felt that I could survive a surge like this if it lasted for no more than a mile. Then we met a new potential running partner. His name is Daniel and he is from South Carolina. 2:00 800, 4:25 1600, 9:53 3200 and 15:56 5 K on the road. He supported the tradition of stray running young men in Provo speaking a foreign language. He had served a Cambodian speaking mission in California. He is planning on running with us tomorrow. P.M. 2 with Benjamin in 16:05. 0.5 with Joseph. 0.25 with Jacob. A.M. Ran 10.1. Met Jeff and Daniel on the trail. Did a pickup for 0.5 to test Daniels current fitness. He put in what he thought was a 10 K effort and we ended up with 2:59. Then did a 600 in 2:06 catching up after a VPB. P.M. 2.75 with the kids running group. Benjamin and Jenny did 2.5. Joseph did 0.5 in 4:15. Jacob did 0.25 in 2:29. Julia ran 1.5. A.M. 10.5 - some with Jeff and Daniel, 2.9 with Benjamin. P.M. 0.5 with Joseph in 4:31. 0.25 with Jacob in 2:34. A.M. 6 with Jeff and Daniel. Jeff and I did a 0.5 pickup in 2:24.4. It was supposed to be 2:30, but we started the first 200 in 38 and then Jeff overcorrected. It felt good, though. Jenny and Julia ran 2. A.M-2. 0.25 with Jacob in 1:57. This is his new record. 2 with Benjamin 16:39. Joseph ran 0.5 with us in 4:25. P.M. Took VanGoGo to do safety and emissions. It failed the emissions. The mechanic thought it was because we had not driven it in a while, so he said drive it on the freeway. I figured it was a good chance to study the Utah Valley Marathon course. So I drove the course. After that the test still fail. Had to leave the van to get tuned. On a normal day I would have just run home, but since I am tapering, and have done a quick 0.5 in the AM I needed to limit my activity to the minimum. But I did not want to be on the road for too long, so I just Gallowalked home. So I suppose Gallowalking is useful for something after all. Discovered I could walk at 12:00 pace. Ran some of it at around 8:00, maybe about 0.5. A.M. Tapering. 2 miles with Benjamin in 15:30. 2 with Jenny and Julia in 17:13. One by myself in 1 in 6:46. Jenny wanted to do set a record in the quarter after her run. So we started out at a good pace and she hit 300 in 1:01 fairly evenly, but then she panicked because she thought she was going to throw up and just stopped. I explained to her that feeling like this was normal in an all-out quarter, she realized that all she had to do was coast in and she would have had the record, and now was determined to try again. I explained to her that she was not going to run as well due to fatigue, but given how much ahead of her record pace she was on her first try she should still be able to get it. On her second try she was able to hit the first 200 in 41, then faded to a 23 100, and then 24 finishing in 88, which is still a record by 3 seconds. But her first attempt shows she was capable of about 83 fresh. 0.5 with Joseph in 4:26. 0.25 with Jacob in 1:54. He set another record. Now I am starting to think that the story about Summer Harper's 3:58 half mile at the age of 3 could actually be true. I heard it from Hawk and used it to motivate Sarah to start running back in 1999 right after our first child (Benjamin) was born. She did a time trial to beat that time and nearly died running 3:57. The she decided to start training. But then after I became more familiar with what 3 year old kids are capable of I began to wonder if maybe something was exaggerated in that story. Now Jacob has shed a new insight for me on what a 3 year old kid can do. A.M. Utah Valley Marathon, 2:31:58, 6th place. 1 - 5:26 - with the lead pack (all Kenyans, Peter and Jacob). HR was around 145 due to the downhill (2.9% drop). Believe it or not, it was quite conversational. I was chattering away with Peter. 2 - 10:45 (5:19) - still with the pack, the grade is 2.5% down, felt harder but maintainable, HR was around 155. Still chatty, but not as much as the first mile. 3 - 16:08 (5:23) - The Kenyans had some kind of a discussion, then all of a sudden surged. I told Peter about how they did that to Seth in the Salt Lake Marathon in 2009 and made him run a 4:55 mile. He agreed it was not a good idea to surge with them so we dropped back. The grade was 1.5% drop, HR around 157. A bit too high, but I want to stay with Peter for as long as is reasonable, and 157 is still reasonable. 4 - 21:41 (5:33) - 0.9% grade down, HR 157, Peter is pulling me. 5 - 27:04 (5:23) - 1.4% grade down, HR starts visiting 160 but stays at 157. Still with Peter. 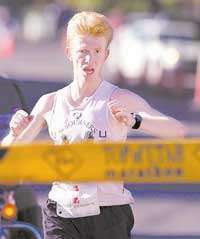 Feeling OK, but I know I should be feeling this kind of OK in the marathon at mile 5. We passed a Kenyan. I think his name was Zack. 6 - 32:41 (5:37) - 0.7% grade down. Peter is edging to press it, but the pace is already too fast for me. So I tell him to go and back off. HR drops to 153. 7 - 39:06 (6:25) - 1.9% net grade up, but rolling a lot. A lot of 6% grades, so a really slow mile. The Course Tool thinks I actually hit it right on for my average pace even though it was 38 seconds slower than flat. HR stayed at 160 during the climbs and visited 163 mark briefly. I had not looked at the Course Tool prior to the race, so this came to me as a surprise. That is one place where it is easy to misjudge the grade. Plus it occurs at 5500 feet, which has an effect on how much of a hit you get from a given uphill grade. This ended up being the slowest mile of the race for me. 8 - 45:08 (6:02) - 0.2% net grade down, but again a lot of rolling with grades varying from 5% up to 5% down. The course tool says the right split for it would have been 6:07. HR is all over the place from 145 on the down to 160 on the up. 9 - 50:50 (5:42) - 3.1% grade down. HR did not crack 150. The Course Tool says it should have been 5:24. Probably was having a hard time shifting gears after the uphill grades earlier. 10 - 56:41 (5:51) - 0.1 % grade down on a roller coaster of grades varying from 4% up to 4% down, but mostly staying in the 2% up/down range. Got some rhythm. Do not remember the HR, but I imagine around 153-155. The Course Tool expected 6:06. 11 - 1:02:31 (5:50) - 0.7% drop on a roller coaster similar to mile 10. 12 - 1:08:30 (5:59) - 1.1% drop, the roller coaster continues. Right on with the Course Tool. 13 - 1:14:16 (5:46) - 0.4% drop, more steady. The Course Tool was confused there because of the tunnel. Half - 1:14:53. Time to do some assessments. Given how I am feeling and that I did have to be aggressive to get this slow of a split, sub-2:30 is probably out of the question unless there is a strong and steady tailwind all the way combined with no crash, which is too much luck to ask for. If I average 6:00 to the finish that gives me a high 2:33. I'll be OK with that. If there is a crash of average severity, I might not average 6:00 to the finish. So we are looking at 2:35, which is on the edge of being embarrassing. I'll just take it a mile at a time, and try to put as much gap on the 6:00 guy for the second half as possible, so I can still hold him off if I do crash. 2:33 will be better than embarrassing. 14 - 1:20:01 (5:45) - 1.2% down, more or less steady. Hey, that invites illusions of breaking 2:30, but in order to do that I would need to be as fresh in the last 6 miles as I am now. But still it is nice to think about being technically on pace for 2:30. 15 - 1:25:59 (5:58) - 1.4% steady up. This is exciting. Last year the split on that mile was 6:02, and I was in a pack at mile 5 instead of being alone at mile 15. The course is different this year. 16 - 1:31:29 (5:30) - 3.4% steady down. Got going. Last year the split was 5:33. 17 - 1:37:01 (5:32) - 2.4% down with some rolling. Last year 5:25 on Jeff's initiative. Still technically on pace for sub-2:30, but the marathon has not yet started. 3 more miles to go before it starts. Marathon starts at 20. If you can get there ahead of pace without killing yourself, you get the privilege of the early start, and it does not count against you. 18 - 1:42:50 (5:49) - 1.2% down. Last year 5:34 on mile 8 in the same spot. The fatigue is starting to show. But I am still sub-6:00 and with a couple of 5:30s in addition to not slipping over 6:00 on the uphill I have a good gap on the 6:00 guy for the second half. However, all it takes to lose it is a couple of 6:30s, which can still happen. 19 - 1:48:46 (5:56) - 1.1 % down. Last year 5:36. Still sub-6:00. 20 - 1:54:45 (5:59) - 0.9 % down. Last year 5:40 on the matching mile 10. The long anticipated start of the marathon. One thing I do not like about marathons is that it takes almost two hours of running before the race begins. You can really psych yourself out with the anticipation. If you hurry to get there, you might end up too tired to race and perform poorly in spite of the head start. If you take your time, you can get there fresh, but the race will have already started without you. Time to assess again. Last year split at 20 miles was 1:55:50 and the preceding mile was 6:19. This year things look more promising. The split is a good minute faster, the pace is 20 seconds per mile faster, and we drop 290 feet in the last 10 K at a fairly steady grade with only two minor climbs, one by the Country Club and one on the bridge in the last mile. So it will be faster than 2:35:46, but by how much? Sub 2:30 by now is impossible. I will need to run a 35:15 10 K, which is not happening if an honest effort is giving me barely sub-6:00 at this point. However, something like a 38:00 while challenging is still realistic. That would give me high 2:32 which would be not too far off my prediction of 2:32:00 on the message board. I decided to set a goal of hitting at least one mile in the "zone" under 6:00. Then hopefully the momentum will carry me through something like a 6:10, and maybe one more. Then I will smell the barn, and give it a good push, and maybe the slowdown could be stalled. Still not quite 38:00 for the last 10 K, but worth a try. 21 - 2:00:40 (5:55) - 1.3 % down. Goal met. Let's do one more. By this time I started to catch the half marathoners and they served as easy targets. Every little bit helps in the "zone". Zero in on a runner ahead of you. One nice thing is that unlike when you race your competition he always comes to you at a fast rate, and then there is another to zero in on. You can even fancy that a runner ahead of you has blown up and you are moving up a place. So you are easily meeting the goals and that helps you keep the spirits up when the blood sugar is down. 22 - 2:06:37 (5:57) - 1.2 % down. Another sub-6:00. Encouraging, but do not get a big head over it. Still 4 miles to go and the blow up can be spectacular. Doing some crazy math. If I average 7:30 to the finish, this gives me 2:37. That would be embarrassing. But I am not likely to average 7:30, I always drop gradually. So let's say I average 7:00. That would be 2:35. I like that better, especially since I am not going to average 7:00, at least I am a good minute faster than that pace right now and I am feeling quite strong. OK, let's try another one under 6:10. 23 - 2:12:40 (6:03) - 0.5% net down, but with a climb by the Country Club. Better than expected. Do I have another good mile in me? How about a good 5 K? Hey, 20:00 5 K gives me a low 2:33, and by now I am feeling quite confident I could run a 20:00 5 K.
24 - 2:18:41 (6:01) - 1.3% down. On pace for a sub-19:00 5 K, but still 2 miles to go. 25 - 2:24:44 (6:03) - 0.7% down. During this mile a police officer underestimated my speed and thought a car could safely cross in front of me. It did make it, but it was a bit too close for comfort. So he commented about his mistake. I'll take his mistake as a compliment, especially during mile 25. ). I noticed that my HR goes up as high as 90 on some moves while normally when I am sitting down in the evening on a warm day it hovers between 57 and 65. So I knew how I could get some adrenaline. I thought about a tournament game I played two weeks ago against a player that was rated 200 points above me. I was a bishop up, and had a mate threat that he could only stop by sacrificing his rook. So in essence I had a win in the bag. But unlike running, one mistake is fatal. I improperly captured his rook, lost my queen, lost my rook, and ended up playing queen against a bishop which resulted in a loss. This did the job. HR hit 160 on the bridge, and I was moving. Kick - 1:15 (5:52 pace) - 2:31:58 at the finish. The results have not yet been posted, but the finishing order from what I gathered was two Kenyans, Jacob Buhler, Peter Vail, another Kenyan, then me, Dave Holt and Clyde. The time is the fastest I've run since 2007. It was nice to break a dry spell of pour marathon performances. It was also my marathon debut in clogs. I am pleased to report that aside from some minor slipping on wet uphills there were absolutely no issues - no blisters, foot pain, etc. So I have proven that a sub-2:32 marathon can be done in a $10 pair of clogs bought at Walgreens. Of course, Abebe Bikila proved in 1960 Olympics that a 2:15 marathon can be run barefoot, shoe cost being zero. Indeed, it is not the shoe that makes the runner. I was also happy that my second half was decent (1:17:05), and my last 10 K (the real part of the marathon) was 1 minute faster than my optimistic goal at 20 (37:13). Update - results are at Stride Racing. P.M. 2 with Benjamin in 16:55. 0.25 with Jacob in 2:24. 0.5 with Joseph in 4:36.